From now on, I will be using 'nail of the week' instead of nail of the day'. I realized my nails do not chip off quickly so it saves me from shifting to another design right away. 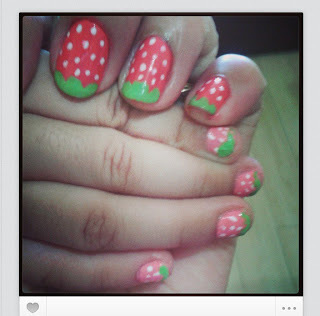 This pink strawberry nails for example is already 1 week old. I was supposed to try another nail design today, but it still looks good. I guess I will continue wearing it till next week. It is really pink. It's just the camera which makes it look reddish. I used pink as a base, green for the crown and white for the dots. Lastly, I applied a colorless polish as coating for protection. The daughter has also the same nail art in baby pink. As shared in my Instagram account. For my next nail art, I am thinking either another fruity nail or ombre. We'll see which design wins. Happy weekend to each and all. Muah!